This spring of 2017, Toy finally began the formal commissioning of his long awaited FIRST CASTING of what has been his most popular virtual world 3D mesh art statue - Princess and the Goblin. After Toy's bronze casting of SHATTERED (the first ever real world bronze casting of a 3D mesh artwork in SecondLife®), many of Toy's art fans requested / demanded that as much as they loved Shattered, they wanted to see Princess and the Goblin cast into bronze. This first casting of Princess and the Goblin has become urgent as Toy has a Real World art exhibit in July 2017 of which he would love to show this bronze along side of Shattered. So, this first ever casting of Princess and the Goblin must be executed fast. As such, Toy will have a very short Pre-Order period (1-2 weeks) and only order a few extra editions beyond what the quantity of pre-ordered commitments. The tiered pricing of these first cast editions will be flat from edition #6 as Toy does not know the exact number of editions that will be pre-ordered. This will be a great buying opportunity the unsold editions and the second casting will likely be more expensive than the 2nd casting. So what is "Princess and the Goblin"? What inspired Toy to create? Why the name for dancers? Actually what inspired Toy was a photo in the local newspaper on October 5th, 2012. It was a photo of the two main dancers of the Royal Winnipeg Ballet captured rehearsing one of their dance's for the company's production of The Princess and the Goblin. The two dancers were Alexander Gamayunov and Serena Sandford. As soon as Toy saw the captured position of these two dancers embraced he was instantly inspired to see if he could capture the pose as a virtual world digital mesh sculpture. Their pose so expressive and elegant. But Toy decided he would use his love of minimalist human forms to transform the dancers into their characters of the Princess whom was captured and held by the evil Goblin Prince. When he released his Princess and the Goblin sculpture in SecondLife®, it immediately become his most loved and popular art sculpture. In fact it often personified spirit of the hugely popular SL stage choreographed artistic dance community. To date, Princess and the Goblin continues to be Toy's most popular sculpture. It was only natural to cast this statue into RL bronze! 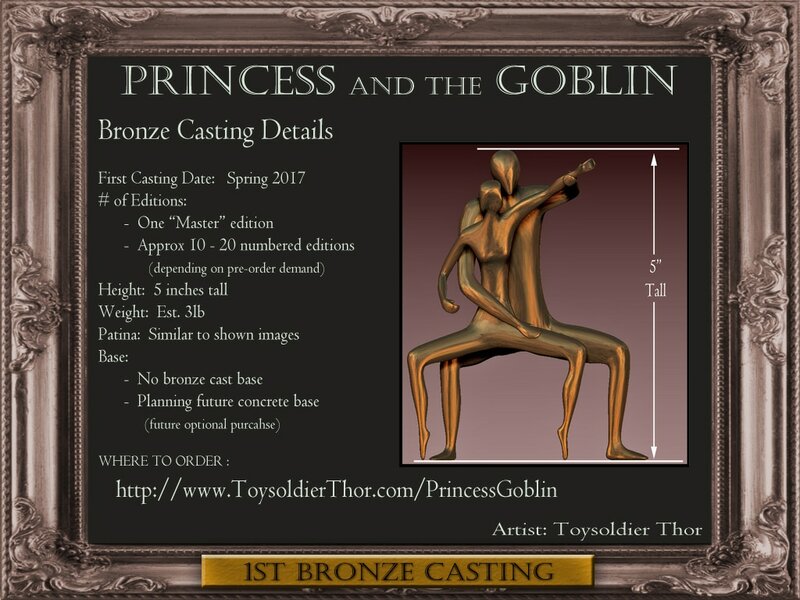 It is critical to understand that because this is the very first ever bronze casting of Princess and the Goblin, Toy has NO ACTUAL PHOTOS of what the final completed bronze cast editions will look like (especially the finishing / patina applied to the bronze). He has asked the foundry artisans to try to replicate the bronze patina to be as close as is possible to the digital photos used in these promotion images of Princess and the Goblin. But it will likely not be exact and possibly more mat surfaced - not shiny. Those pre-ordering as part of the first casting are going on the mystery journey of the final result with Toy. Unlike SHATTERED, Toy was not able to produce a local 3D print of the prototype model so he will be placing even more trust in the talented artisans of the metal art foundry in China he has worked with for Shattered. They will provide Toy photos of the 3D printed master as well as the wax models. It is exciting to be receiving one of these very first castings and for an art collector - these are the most valued editions, but there is the unknown of the actual results until they are completed. Toy wanted to make sure all those participating are fully aware of this journey before committing. He has trust in the amazing talents of the foundry artisans to deliver - but there is always risk. This Order Form initiates your PRE-ORDER invest in one of the numbered 1st edition bronze castings "Princess and the Goblin". Toy will contact you directly to confirm the edition you selected and provide more details to the process. Each bronze edition will be numbered at the foundry so it can be registered to each buyer. Price of editions reflect their "numbered" value. The lower edition = higher value to art collectors. Editions are First Pre-Ordered - First Reserved basis. Prices do not include shipping from Artist in Winnipeg Canada to customer.